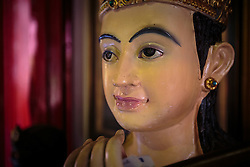 Wat Kanikapon was built by a famous madame in 1833 during the reign of King Rama III. She was known as Grandmother Faeng. 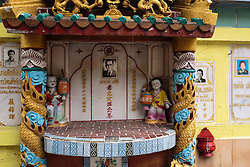 Her brothel was in nearby Sampeng Lane in Chinatown. 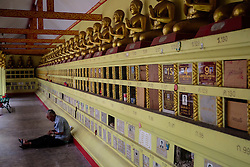 She was a devout Buddhist of the Maha Nikaya sect and she and her girls collected money for the temple. 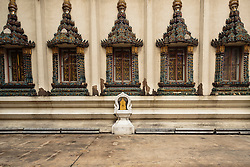 When Rama V became king, her family renovated the temple and asked him for a name. He called it Wat Kanikapon, which means 'temple built from the earnings of prostitution'. 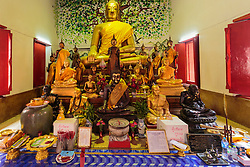 The original Buddha image is still there. The window frames are like the green curtains, which indicated a brothel in Chinatown. 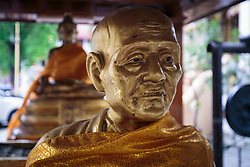 Madame Faeng invited Father To, a renowned monk, to deliver a sermon for the temple's opening. There is a statue of him in the courtyard. 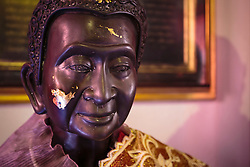 Grandmother Faeng's bust looks like it has been made from a mould for a monk with a wig stuck on it. Beside it is a tray of lipsticks and perfumes.